. 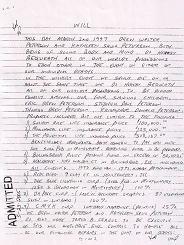 Stacy Missing (Wife#4) Who's Who Names Transcript Links Jury Inquest 2004 Unsolved Mysteries Alex J. Morelli Files .
. Drew Peterson Drew's House Tour '08 Suds Pub History Drew's Other Woman Hearsay Trial 01/19/10 Murder Trial 2012 . This day March 2nd 1997 Drew Walter Peterson and Kathleen Savio Peterson, both being of sound body and mind, do hereby bequeath all of our worldly possessions to each other in the event of either of our individual deaths. Beneficiary Merchants Bank Oswego to pay off note for Sud's Pub in Montgomery," Remaining funds to be divided. 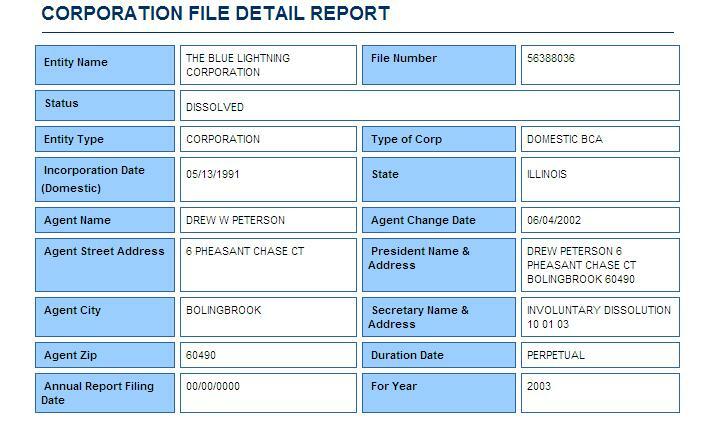 4) Bolingbrook Police Pension fund in excess of $50,000. 5) Real Estate - 1040 Walden Ct in Bolingbrook, Ill, including ALL Contents. 1993 Ford Van - 1992 Nissan Pathfinder. 6) Real Estate - 9 Clay Ct, in Montgomery, Ill.
We Drew Walter Peterson and Kathleen Savio Peterson do also name James B. Carrol to be executor of this will and to have full control to handle all of our financial affairs in the event of our deaths. 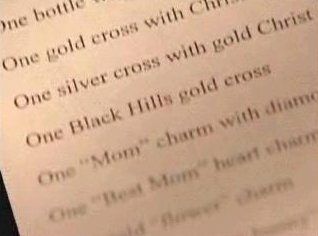 It is also the desire of Drew Walter Peterson to have his remians creamated and burried with the remains of his wife, Kathleen Savio Peterson. We Drew Walter Peterson and Kathleen Savio Peterson do hereby make this our last will and testament. No-fault divorce ILL 11/04/2007 (www.suburbanchicagonews.com) "A history of failed marriages"
"The marriage lasted fewer than 10 years before the couple filed for a no-fault divorce. The dissolution was finalized on Feb. 18, 1992, and the couple's assets were split equally. [Victoria] Rutkiewicz waived her right to Peterson's police pension, according to court documents. The couple's joint property on the 400 block of Seminole Lane [428 SEMINOLE LN, BOLINGBROOK, IL 60440] in Bolingbrook was to be sold with proceeds being divided equally, with Rutkiewicz maintaining the rights to a property in Montgomery and Peterson the rights to a second home in Bolingbrook on the 1000 block of Walden Court. 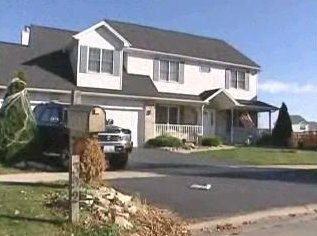 [1040 WALDEN CT, BOLINGBROOK, IL 60440]"
"Additionally, [Drew] Peterson kept the couple's 1988 Ford truck and ski boat while [Victoria] Rutkiewicz took possession of a 1990 Pontiac passenger vehicle and a 1985 Chevrolet Camaro. The couple jointly owned a business, Blue Lightening Corp. Each retained 49 shares of the corporation's 100 shares of issued stock, though the company also dissolved." CRAIG WALL: Kathleen Savio's signature is distinctive, fluid lines with a dash of flair, it's penned on the bottom of a two page hand written Will, being of sound body and mind, she and Drew left all their possessions to each other in the event of either of their deaths. DREW PETERSON: "There really wasn't nothing sinister about it, just something simple if something happen if we were on vacation." CRAIG WALL (Voice Over): "The date of the Will, March 2, 1997, nearly seven years later almost to the day Kathleen Savio would be found dead in her bathtub. That simple handwritten statement would become her Last Will and Testament." ANN DOMAN (Kathleen’s sister): "She told me she would never make the divorce, she would never live to see the end of the divorce." CRAIG WALL (Voice Over): "What was once ruled an accidental drowning is now being investigated as a possible murder." JAMES GLASGOW (State’s Attorney): "There are strong indications that it was a homicide." CRAIG WALL (Voice Over): "Now that long forgotten Will, evidence in the investigation." KAREN CONTI (Attorney): "The effect of the will was very beneficial to …. Peterson." 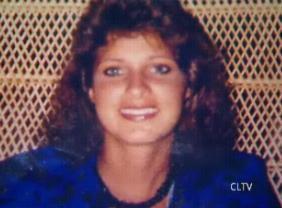 CRAIG WALL (Voice Over): "Attorney Karen Conti reviewed the probate records in Kathleen Savio's estate for Fox News. She [Kathleen] and Drew Peterson were divorced but in a rare move the judge allowed them to figure out the financial settlement later." KAREN CONTI: "What was left to be resolved between these two people was money. There was the house that was sold, there was a property, a bar that was sold and they were fighting over the cash." 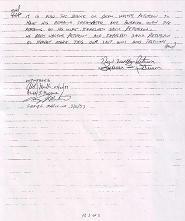 SUE DOMAN: "Finally they come to somewhat an agreement, two weeks before it was to be distributed she died. It's a fantastic coincidence." CRAIG WALL (Voice Over): "It had been a bitter divorce. Her husband was in the middle of an adulteress affair with 19 year old Stacy Peterson and while Kathleen remembered to change the beneficiaries on her life insurance there was still that Will." JOEL BRODSKY: "To revoke a will is a very simple act. 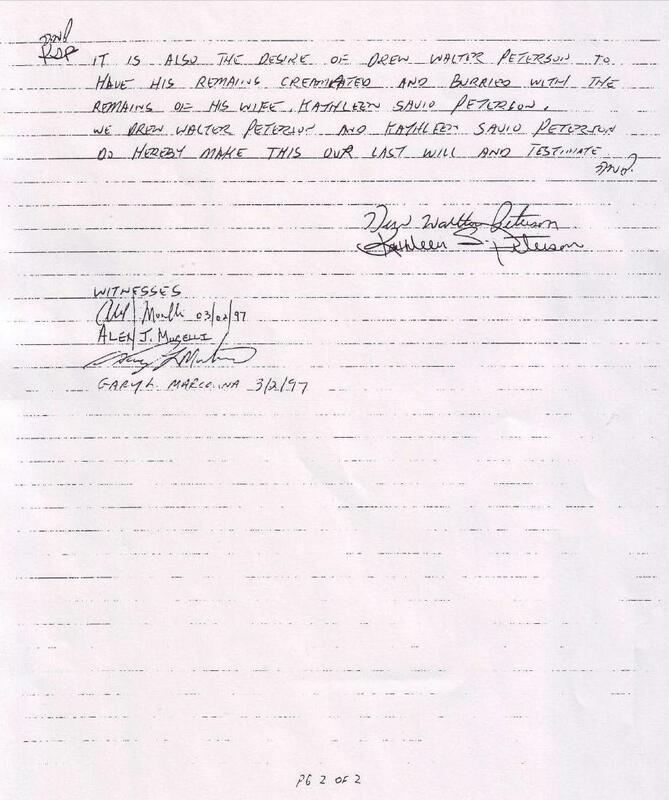 You just have to sign a piece of paper saying I revoke a will and have it witnessed by two people and it's revoked and since she didn't do it I have to assume this is what she wanted to happen." 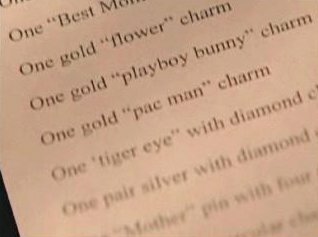 CRAIG WALL (Voice Over): "So despite the divorce, Drew Peterson got all her furniture, jewelry and the money from the sale of the home, about $288,000 thousand dollars. He was also named guardian of the children's million dollar trust fund." KAREN CONTI: "If you look at it they are trying to iron out their differences, it's not working, she ends up dead, a Will appears, it's a pretty good timeline to show motive." JOEL BRODSKY: "I guess if your going to say this is a motive for murder, there isn't a divorce that occurs where there is a motive for murder." CRAIG WALL (Voice Over): "But take a close look at the will." 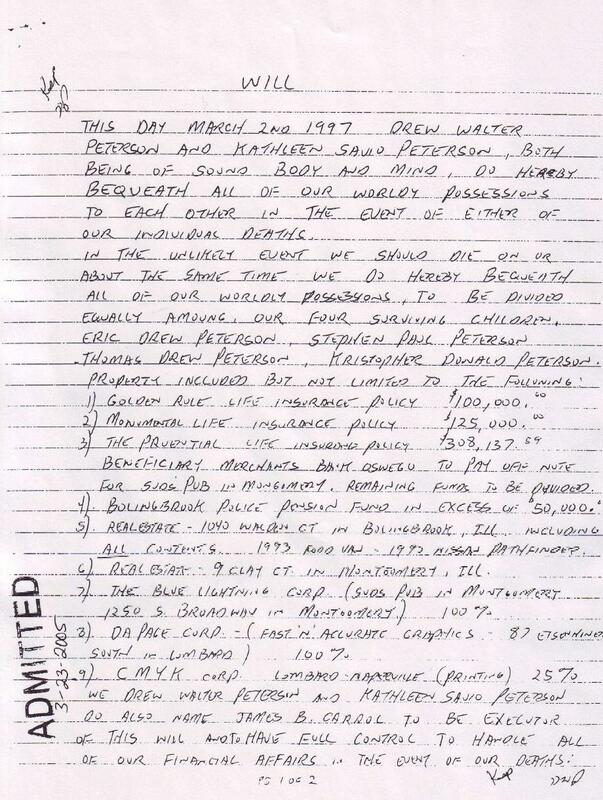 DREW PETERSON: "I wrote up the will with Kathleen's instructions and we simply had a couple friends that were over to witness it and that was that simple." CRAIG WALL (Voice Over): "Those friends turned out to be Peterson's former partners, in the Bolingbrook Police Department and according to the Savio family, Drew's best man at their wedding. Alex Morelli, Drew's former partner says he wants nothing more to do with Drew and has nothing positive to say about him. He said Drew has turned his world upside down. Best man, Gary Marcolina took off when we tied to talk to him. The old Will names James B. Carrol, Drew’s Uncle, names him executor and gives him full control. He confirmed the account that he was going on vacation but declined to comment further. Once the Will was admitted into court, Carrol promptly fired Kathleen's attorney and discharged another lawyer appointed by the court to watch out for the best interest of the children. So Mr. Carrol had an obligation not to be looking out for Drew but to look out for Kathleen."